Education has gone digital. The worldwide e-learning marketplace is forecasted to reach $243 billion by 2022. In particular, self-paced education has become popular, making massive open online courses (MOOCs) viral. The reason for this virality is that MOOCs save students a lot of time and bring flexibility to education, allowing learners to choose their own subjects and path of study. If you feel like stepping into the EdTech game, keep reading this post. 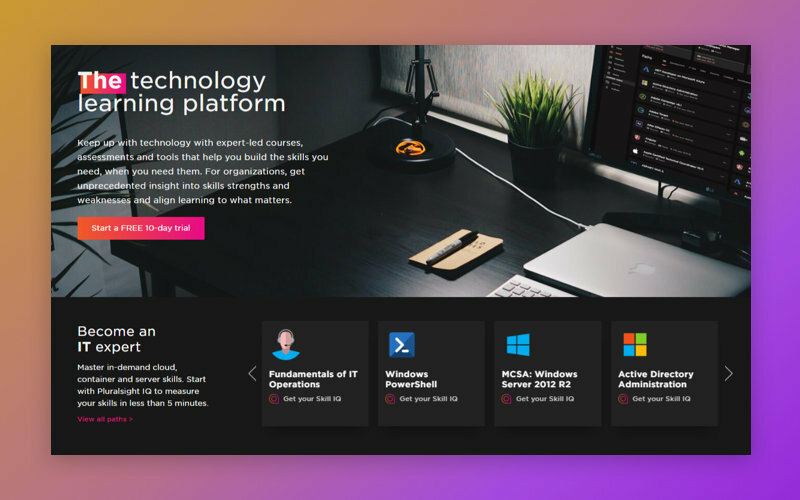 You’ll discover the types of eCourse providers, the typical troubles they face, and how to create the perfect digital learning platform of your own. What types of MOOC providers are there? All MOOCs use a similar method to educate people: video and text materials, quizzes and tests to check knowledge, and a community of learners and teachers to provide assessment and feedback. Additionally, MOOC providers offer sets of related courses with capstone projects as a sort of final exam. These capstone projects can involve investigation and research of real-world challenges in an industry, and are created and checked by industry professionals. Platforms with massive open online courses can provide a wide range of topics to study (like Coursera) or can be narrow and specific (like Pluralsight, which is focused on technology learning). Prestigious colleges and universities (Coursera, EdX). Learners choose MOOCs from prestigious institutions as alternatives to offline education, allowing them to get a certificate or even a degree equal to an on-campus degree and opening up career opportunities. Traditional degrees can cost quite a lot ($15,000–30,000 on average). Independent instructors (Udemy, Ted Ed). This type of MOOCs is very affordable, as most of these courses are created by independent instructors. However, certificates from such courses have less value and don’t normally stand in for a traditional diploma. What are the troubles with MOOCs? While MOOCs are definitely on the rise, there are issues that prevent them from becoming even more successful and widely accepted. Let’s look at these issues. Quite a lot of people still believe they can only get a good education at a prestigious college or university. MOOCs, especially those with content from independent instructors and not partner universities, don’t have the necessary level of trust and stature. As a result, massive open online courses attract fewer learners and less revenue than they might. According to research by Wired, 90% of MOOC learners don’t complete a course. Most of those who don’t finish name low motivation as their reason for dropping out. MOOCs require a high level of self-discipline and self-motivation. Quite often, learners mention the lack of content diversity and quality as reasons why they don’t like MOOCs. Some MOOC providers allow anyone to create a course as a way of attracting more instructors. But only a small percentage of course creators are actual experts and professionals, which pulls down the reputation of MOOCs and scares off potential students. Additionally, massive open online courses may have insufficient content curation or even no curation at all, which also demotivates learners. This issue is the result of all the problems we’ve previously mentioned. If your MOOC platform has problems with its reputation, course completion rate, content quality, and user friendliness, you won’t be able to get new users and your revenue will remain the same or even drop. Moreover, educational platforms sometimes face technical problems like issues with platform architecture, not being ready for a big flow of users, and data breaches. How to build a trusted teaching and learning platform? We’ve prepared some advice on how to create or improve your existing massive open online course platform and solve the problems we’ve mentioned above. We’ll skip the basic MOOC features and focus on the most important ones. Partnering with top educational institutions is the way to bring prestige to your MOOC platform and get quality content. But how do you know if someone is actually a professional instructor? Qualifying to teach on a MOOC platform. To make sure that the content of your courses is created by top instructors, you’ll have to develop a mechanism to verify content creators. For instance, on Coursera, only representatives of universities, colleges, and other educational institutions can offer MOOCs. We’re not saying that you have to do the same and only let instructors from universities create MOOCs. But we definitely recommend building a custom verification form to ensure that learners on your platform are taught by real experts. 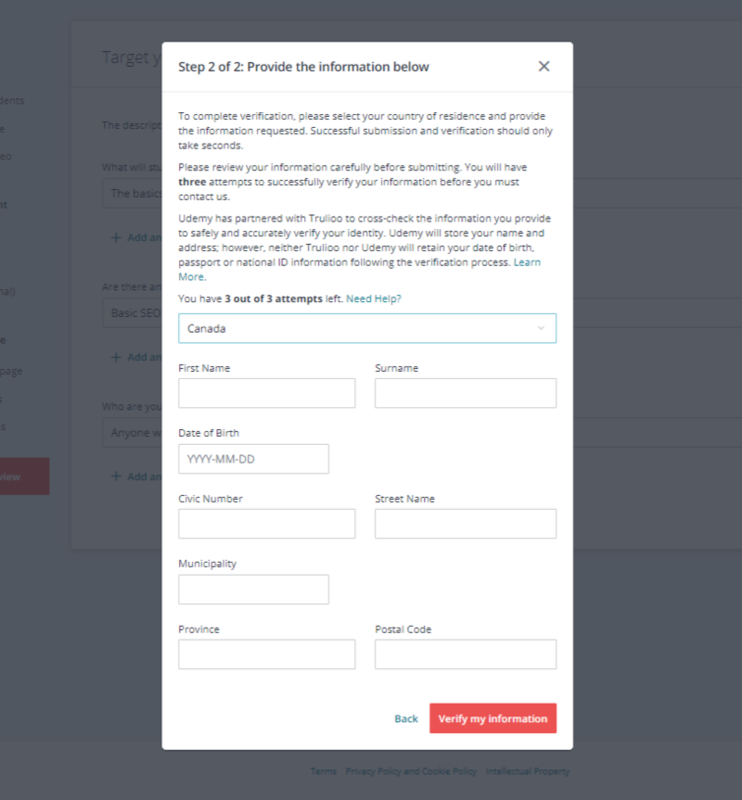 This could be a custom verification page to check a number of requirements for content creators, such as residence, age, and experience. Or, as Udemy has done, you can build a page that integrates with Trulioo’s identity check tool, leaving verification to a third-party service. a course title, category, and description. You can also allow course creators to target learners by explaining who the course is for and what the prerequisites are, such as being able to read music or having basic knowledge of SEO. videos with subtitles, slides, and text. Videos are generally attached to a lesson. quizzes and exercises that are checked automatically. If you’re planning to provide courses for different industries, consider creating a custom exercise builder that can be applied for any subject, including programming. 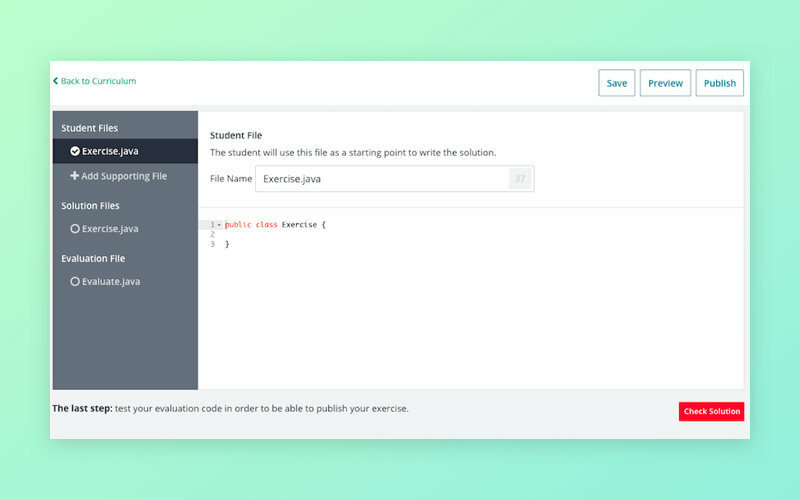 Below is an example of a coding exercise builder on Udemy. When creating large amounts of content, there might be some mistakes. This is why you should let instructors preview content before publishing and edit content they’ve already uploaded to your platform. We’ve actually written a post on how to curate content on your educational platform: 4 Ways to Manage Content on an Educational Platform. Recommended courses. You can suggest courses to users based on their preferences. 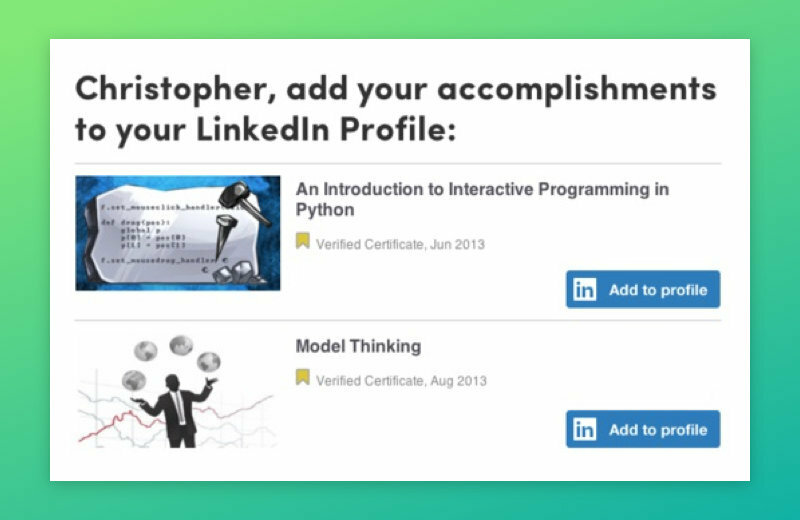 In addition, after users complete courses, your MOOC platform can offer specializations, degrees, and other courses similar to those completed. 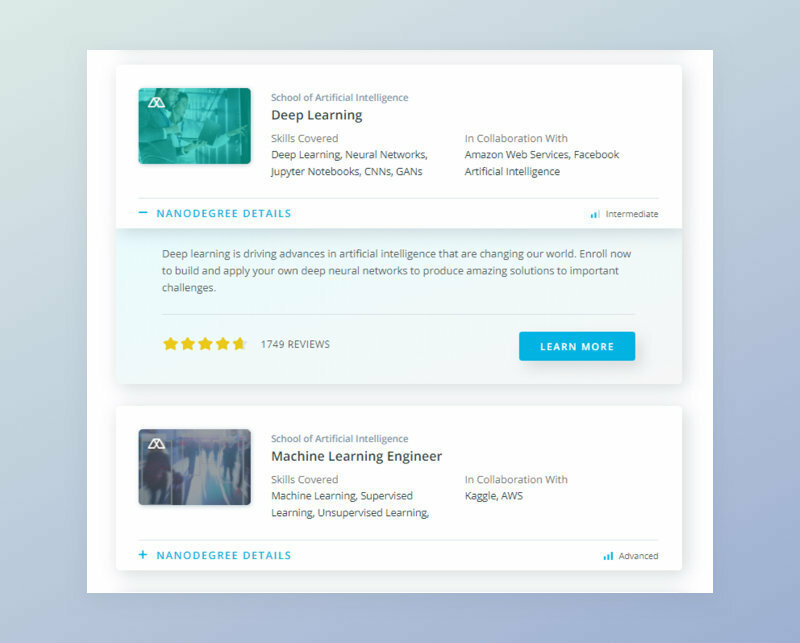 You can make recommendations even more personalized using continuous machine learning. 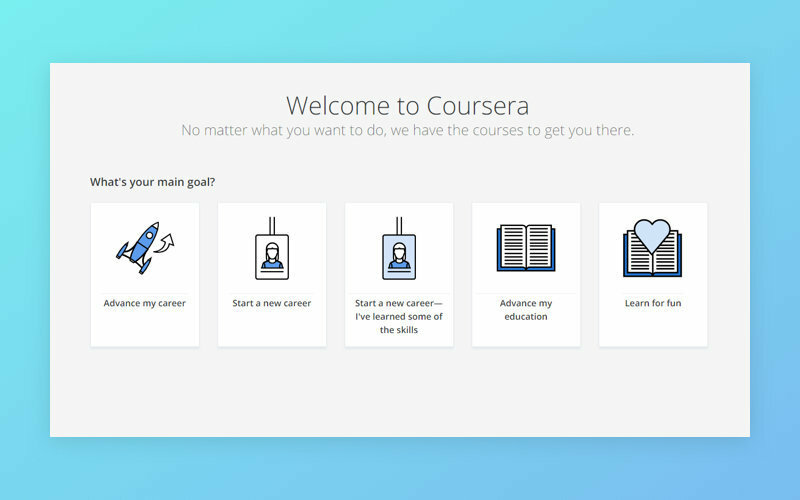 Coursera offers a custom tool to let users find great courses based on their purpose of learning: career opportunities, education, or fun. Auditing courses. Learners should be able to sample a course before enrolling. Coursera allows users to view intro videos that tell them what knowledge they’ll obtain from a course and what tasks they’ll face. To get a better feeling of a course, learners can audit courses. This means they can view videos and texts from paid courses for free without being able to access tasks, capstone projects, and certificates. Coursera has this feature, allowing users to audit some courses, and Udemy does this as well, limiting the quality of materials available for auditing and making the process not that convenient. For instance, when auditing a course on Udemy you can download videos with 360p resolution instead of the 720p or 1020p that are normally available for purchased courses. How to simplify enrollment for users and course creators? A clear and simple UI and UX are an integral part of any MOOC platform. You’ll have to guide your users on your educational platform. Once users have registered, you definitely need to explain to them how your MOOC platform works. 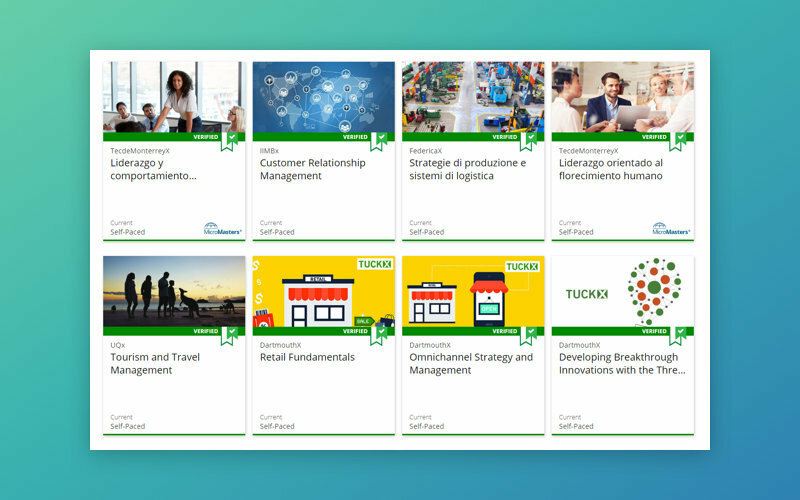 Udemy has a set of educational videos to onboard learners and instructors. Coursera shows tips and offers a help center. However, none of the existing MOOC providers offers truly informative onboarding that shows users the way from the moment they join a MOOC to the moment they complete a capstone project. To ensure your users aren’t overwhelmed with information, you can show tips gradually. For example, when users take a test for the first time, explain how to do it; if they’re watching a video for the first time, tell them about the player controls. We’ve already investigated the topic of onboarding users, so you can see our article on that for more details. Users can have issues that aren’t explained in your FAQ or onboarding. That’s why most MOOC providers like Coursera and Udacity have a help center. This is a subdomain with categorized articles about how to set up an account, make payments, enroll in courses, and overcome any troubles in the learner’s way. If you want to add a personal touch and help users as fast as possible, you can integrate a live chat support service like Zendesk. But don’t forget to hire a team of professional support managers in that case! A course is great and efficient if users study regularly. Most likely, course instructors suggest a certain schedule for their MOOCs. We recommend integrating with Google Calendar and Outlook to allow users to add classes from your educational platform to their personal calendars so they don’t miss classes. You can send either push notifications or emails to your users, but it’s way better to combine them. For messages, home assignments, and class reminders, it’s better to use push notifications, while emails will do great for every other scenario. How to make studying more convenient? Self-studying with a MOOC can be terrifying, albeit convenient. This is why every single element of your platform should be helpful and comfortable. Again, we’ll focus on the most important UI and UX features to give users the learning experience they deserve. Some users may not have a stable internet connection to watch videos online. To help them, you can allow learners to download the course materials in various resolutions from your course or player interface. Most MOOCs are in English. But people who don’t speak English may simply avoid such courses. MOOC providers understand that and have started providing content in other languages too. Coursera, for instance, has courses in Spanish, French, Chinese, Portuguese, Turkish, and Arabic. Aside from subtitles and providing courses in different languages, think of localizing courses, helping instructors translate their content. This can involve either translating text materials and video subtitles or completely localizing the whole course, including dubbing video materials. 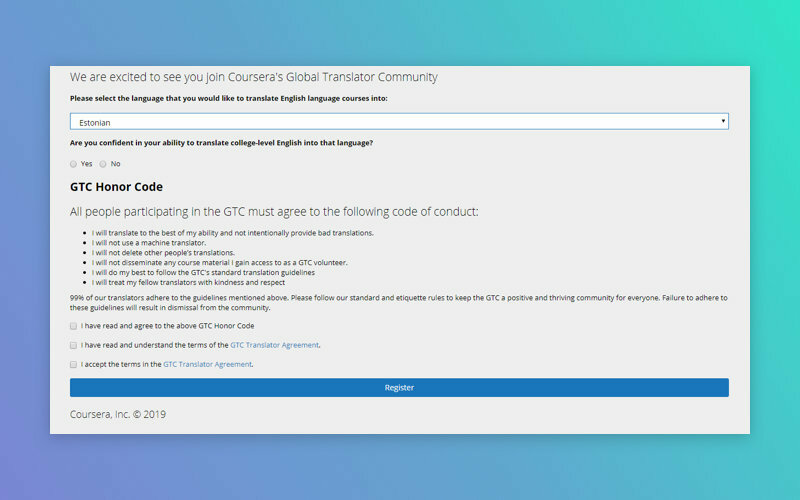 Coursera has a translator community that lets anyone become a translation contributor or get professional assistance in localizing their courses. As you can see, your MOOC definitely needs a community. You can either use social networks like Facebook and let users communicate there or build your own forum. The latter brings more advantages, as you’ll be able to control your community, configure it to your needs, add any functionality you want, and react quickly to users’ requests. If you look at the examples of the top MOOC providers, you’ll find custom-built communities like on Coursera. How to motivate MOOC learners? One of the biggest problems with MOOCs is their low completion rates. But is there a way to change it? 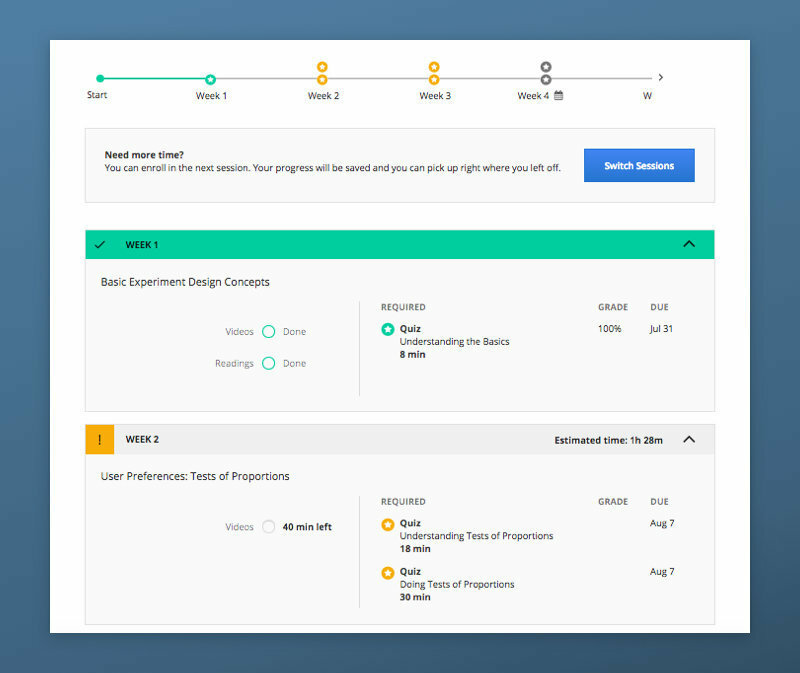 Coursera also allows learners to jump straight to the next step in their course directly from the dashboard, saving time. 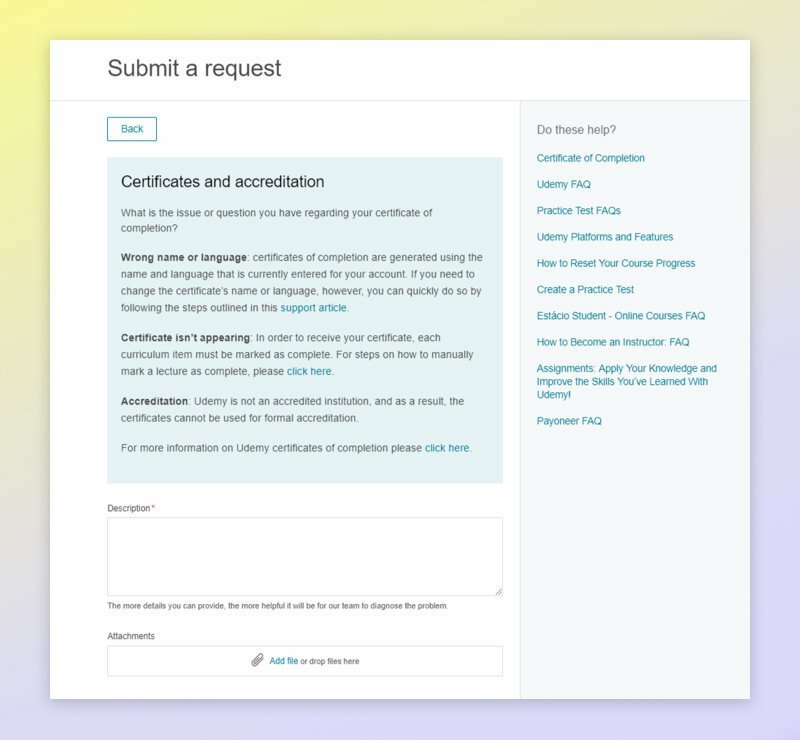 Your MOOC platform can follow Coursera’s example and develop a custom certificate builder. Another option is to use a certificate builder by Venngage, SmartDraw, or other providers. While your community can be a tool for learners to communicate with instructors and get feedback from them, you’ll need to think of a way to provide live Q&A sessions. One way is creating your own live streaming tool, but it will take way more time and effort than using solutions by YouTube, Twitch, GoToMeeting, and others. You might worry about how to get instructors to cooperate with students, as they’ll have to spend more time answering questions, assessing work, and giving feedback. Coursera’s example can help you again in this case. Courses with instructors are called curated courses and cost more, so teachers get a reward for the extra effort they make. How can you make a MOOC scalable? MOOCs often face technical problems like low content loading speed, 404 errors, and data security issues. But there’s good news: There are ways to ensure the secure and stable operation of your MOOC platform. Coursera, Udemy, EdX, Udacity, and other platforms are accessible to learners all over the world. But the same content may load at different speeds depending on how far users are from a server. To avoid this issue, you can use a content delivery network (CDN). A CDN stores a cached version of your content on different servers around the world. Users will get your content from the nearest server, minimizing the loading speed. There are plenty of CDN solutions on the market, including ones by Amazon and Microsoft, so you’ll surely find one that meets your needs. MOOC platforms pay tons of money for developing great educational products on premise. Often, up to 50% of money on MOOC platform development is spent on equipment. This is one of the reasons why educational platforms are becoming cloud-based. But in most cases, MOOC providers start using cloud services because of scalability. Using a cloud PaaS or IaaS solution, businesses can scale on-demand, adding more servers when the load on a platform grows. You can discover more about existing cloud solutions for app development in our previous article. Content is the main source of value on your MOOC platform, so it has to be kept secure. That’s why your database will require smart firewalling and input validation. Choosing a proper database can be tricky, and you might have to use multiple databases and mix different types. Choose databases depending on your project’s needs and your educational technology stack. And if you need assistance with selecting databases, you can read our recent post on that. Even though the MOOC market is filled with big projects, there still isn’t a perfect educational platform to satisfy the needs of all users. Some MOOC providers have issues with UI and UX; others face security or reputational issues due to the low quality of content or lack of diversity. Your MOOC platform could solve all these problems. If you’d like a guide through the MOOC web and mobile app development process, we’d be happy to help!